« Who’s King of the Pasture at Montana’s National Bison Range? Bert Gildart: Next year Montana’s National Bison Range will be celebrating its 100-year anniversary, and perhaps in part because of that historic event, much attention is being focused on the refuge. EDUCATIONAL RESOURCE: What I’d like to do in this posting is graphically suggest what an incredible outdoor classroom these 18,500 acres can provide. 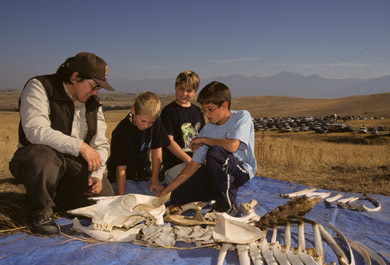 At times various members of the staff enhance the experience by providing hand’s-on outdoor instruction, such as in this discussion of the skeletal makeup of a bull bison. But for the most part, you discover the excitement of nature by driving—and staying alert. BISON CALF: Guaranteed, one animal you’ll see here is the bison, and right now there are 130 cows of breedable age among the refuge’s 300 bison. 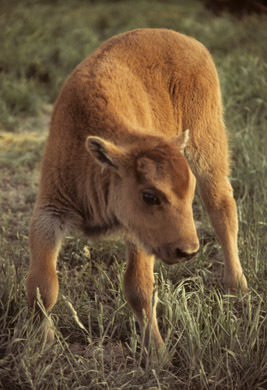 On average about 90 calves are born each year, and this one was born in the spring. It’s a photograph made 10 years ago, and was taken at the first pasture that greets you near the visitor center. To facilitate your explorations, there’s a 19-mile long loop road that takes you through all habitat types, and you can make the complete drive from early May to about the second weekend in November. Other times, there’s a shorter drive and it too provides numerous wildlife sightings. But in a few weeks, you can make the entire loop, and those who do will see some form of wildlife within the first few miles of the one-way drive every time you visit. Guaranteed! ANTELOPE: That’s where I found this group of antelope. 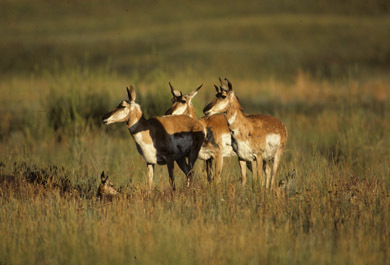 The area is known as Pauline Springs, and if you look closely you’ll see two young antelope on both sides of the adults. They’re lying in the grass, trying to remain obscure. The one on the right almost succeeds, but look near the left hind leg (oriented so it’s on far right) of the adult antelope and you’ll see an eye. Skipping along—and many bison sightings later—the road peaks at mile 8 at an elevation of 4,700 feet. Here, the Bitterroot Trail links with the road and proceeds for several hundred yards to the highest point in the refuge, which is 4,800 feet. 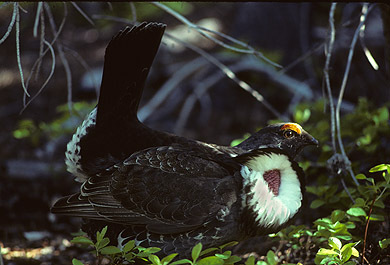 The area is also a hangout for sheep, deer, elk, and blue grouse, and sightings of all these critters are back-dropped by glacier-clad McDonald Peak. At such times, it’s easy to see why radio commentator Paul Harvey proclaimed that one of his favorite Montana drives takes him through the Mission Valley. 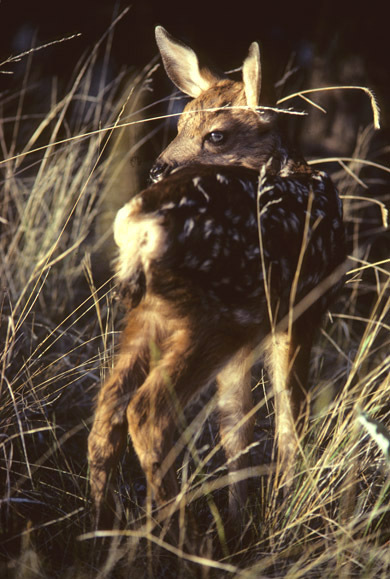 FAWN: From here, the road drops and you’ll possibly see bison and more antelope. But then the road flattens out, and as you near your point of departure on this loop road, look to your right along the creek and often you’ll see white-tailed deer—and sometimes a fawn or two. So there you have it, a very quick sampling from one of our nation’s most incredible outdoor classrooms… Thanks for your time. This entry was posted on Wednesday, April 18th, 2007 at 5:07 am and is filed under Montana Photography, National Lands, Natural History/Conservation, Photography. You can follow any responses to this entry through the RSS 2.0 feed. You can leave a response, or trackback from your own site.